Ancora una volta l' arte e la moda ci dimostrano che non sono due rette parallele. La prossima collaborazione prevede il gioco di squadra di due grandi creativi: Marc Jacobs e Yayoi Kusama per Louis Vuitton. Già in passato, precisamente nel 2006, l'artista giapponese " personalizzò" con i pois, sua cifra distintiva, la borsa Louis Vuitton Ellipse Bag. La collezione, ovviamente tutta polkadot, includerà capi d'abbigliamento, accessori e pigiami di seta e sarà distribuita in 461 stores il 10 luglio, data in cui verrà presentata una retrospettiva sull'artista 82enne al Whitney Museum di New York. E voi correrete per aggiudicarvi un pezzo di questa spiritosa e giocosa collaborazione? Intanto accontentiamoci di una piccola anteprima! Art and fashion always show that they are not detached activities. 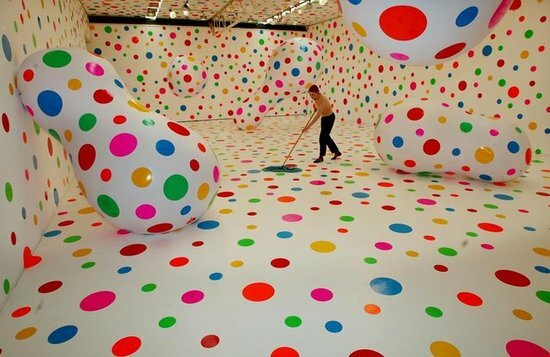 Talking about this, Marc Jacobs, Louis Vuitton's designer, announced that he is collaborating with Yanoy Kusama, well-known in the contemporary art field and famous for always using dots. The Japanese artist will create a capsule collection that will include clothes, accessories and silk pajamas and will available in 461 stores on July 10, in conjuction with the opening of a retrospective of Kusama's works at Whitney Museum in NY. It's not the first time that Marc Jacobs works with Kusama: he met her in Tokyo in 2006. The artist customized Louis Vuitton Ellipse Bag. It is assured that the collection will be very gorgeous! "Her energy is just endless," Jacobs said. "For many people who don't look at art or go to galleries, or maybe they're not aware of Kusama's work, there will be a new venue, a new place to see this work and to come to appreciate it through the eyes of Louis Vuitton."